Healthcare 3D Printing Market size was valued at USD 578.0 million in 2017 and is expected to witness 21.2% CAGR from 2018 to 2024. Rising demand for implants customizations during surgical procedures coupled with growing R&D investments should drive healthcare 3D printing market growth. According to the National Center for Biotechnology Information (NCBI) 2014 data, over next ten years nearly USD 1.9 billion is estimated to be disbursed on medical applications of 3D printing. Such growing investment will boost market growth. Healthcare 3D printing technological advancements and application of advanced devices in the field of bioprinting and tissue engineering should contribute to business growth. Growing clinical usage of 3D printing in pharmacology such as, poly pill that is used for treatment of numerous diseases should propel healthcare 3D printing market growth. Medical applications of 3D printing are growing significantly including, drug delivery devices and new dosage forms applications. For instance, utilizing medical 3D printing in production of cell cultures, bones, blood vessels, jaw bone, tissues, ears, stem cells, eyeglasses, organs, and vascular networks. Above-mentioned extensive applications will upsurge revenue size. Dearth of skilled professionals coupled with excessive cost of 3D printing software should hamper healthcare 3D printing market growth. As per the Society of Manufacturing Engineers, around 9 out of 10 manufacturers are struggling to find expert workers, and nearly 54% of producers do not have strategy to address the skilled labour shortage. Syringe based product segment accounted for 41.1% market share in 2017. Surging use of syringe-based 3D printers in production of varied array of structures used in healthcare will drive segmental growth. Moreover, syringe based offers rapid prototyping that encourages customers to opt for syringe-based products. Magnetic levitation segment is anticipated to grow at 22.6% during 2018 - 2024. Advantages associated with magnetic levitation include easy reconstruction of in-vitro natural tissue environment and culturing of 3D cultures that have long durability. Aforementioned advantages should boost magnetic levitation segment growth. Fused deposition modeling (FDM) held USD 244.5 million in 2017, due to widespread applications such as, healthcare, chemical endurance, high heat endurance and biomedical field. Additionally, escalating adoption rate of droplet deposition technology owing to high number of patients suffering from auditory loss, dental problems, amputees, bone and cardiovascular disorders should foster segmental growth. 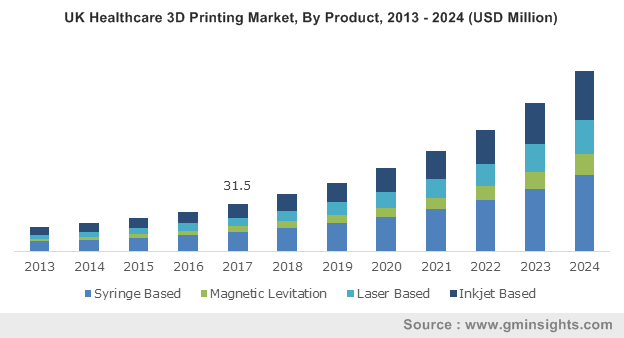 Selective laser sintering (SLS) segment is anticipated to grow lucratively at 21.6% over the coming years. Various benefits such as SLS eliminates requirement for support structures and saves time coupled with minimized issues for tool clearance will spur market size. Medical applications segment held 48.4% revenue share in 2017. Wide-ranging medical applications and availability of 3D printed medical devices such as, external prostheses, instrumentation, and implants will stimulate medical application segmental growth. Additionally, R&D for manufacturing of living organs including, heart and liver will offer immense future growth opportunities. Biosensors segment is projected to grow at 21.8% CAGR during the forecast timeframe due to escalating demand for integrated smart sensors and Nano sensors, along with availability of implantable minimally invasive devices. Additionally, advances such as sensor system, that delivers point-of-care diagnosis as well as biosensors that can monitor patient condition are developments expected to spur market growth. U.S. healthcare 3D printing market accounted for 91.1% regional market share in 2017. Advents in technology and presence of leading industry players offering innovative products will augment market growth. Technological advances include blueprint for manufacturing of finger splints that has applications in arthritis, sprains, fractures, jammed fingers and 3D tumour replicas to assist discovery of new anti-cancer drugs. Germany healthcare 3D printing market held USD 42.0 million in 2017. Surging demand of healthcare 3D printing devices coupled with rising healthcare expenditure should drive regional business growth. Moreover, increasing funding will further propel business growth over the forecast period. For instance, German Emerging Implant Technologies (EIT) received funds from SHS for medical 3D printed spinal implants. Japan healthcare 3D printing market is projected to grow significantly at 20.7% over the forecast timeline. Growing demand for personalised devices by many patients and technological advancements will boost industry size. 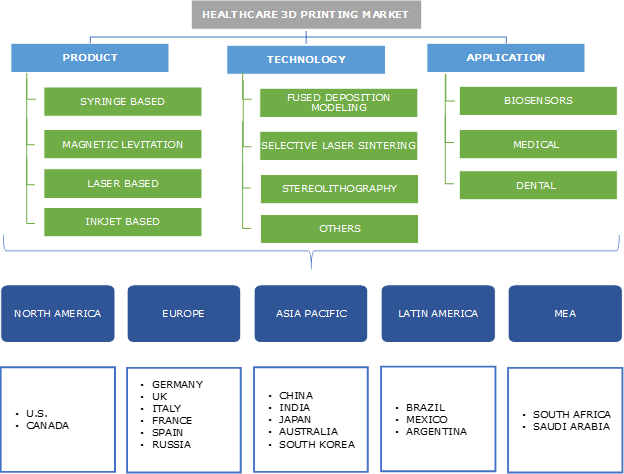 Prominent business players of global healthcare 3D printing market are Aprecia Pharmaceuticals, Aspect Biosystems, Bio 3D Technologies, BioBots, Cyfuse Biomedical, Digilab, 3Dynamics Systems, Envision TEC, Luxexcel, Materialise NV, Nano3D Biosciences, Oceanz, Organovo Holdings, regenHU, Renishaw, Solidscape, Stratasys, TeVido BioDevices, 3D Bioprinting Solutions, 3D Biotek, and 3D Systems. Introduction of new products offering customized implants for patients and several other growth strategies are implemented by key industry players to sustain their position in the market. For instance, in October 2016, Organovo introduced 3D bioprinted human liver as a leading preclinical development in therapeutic tissue for animal models showcasing vascularization, engraftment, & sustained functionality for bioprinted liver tissues. Growing R&D investment in developing economies to launch enhanced 3D printed devices will accelerate healthcare 3D printing industry growth. Moreover, rising trend for personalized implants and surging healthcare expenditure will further boost market growth in emerging nations. Prominent players are focusing on inorganic and organic growth strategies to upsurge their revenue. The industry is expected to witness robust growth in the future owing to rising adoption of advanced healthcare 3D printed devices and launch of innovative technologies. For instance, in March 2017, 3D Systems announced first scalable, modular, and fully integrated additive manufacturing. This would meet durability & requirement of production environment. Competitors are also emphasizing on providing extended services to customers to capture major market share.